Painting © Linda E.S. Roberts, 2007. For permission to use this picture, contact Mark D. Roberts. Though, according to the Gospel record, most of the men who followed Jesus did not stay with him at the cross, his female followers remained to observe his death. All four New Testament Gospels mention this striking fact (Matt 27:55-56; Mark 15:40-41; Luke 23:49; John 19:25). John alone specifies that Mary the mother of Jesus was among the women who remained near him until the end. In the Gospel of John, Mary was standing next to “the disciple whom [Jesus] loved,” believed traditionally to be John, one of Jesus’s closest disciples and the source of the Gospel that bears his name. Observing these two, Jesus said to his mother, “Woman, here is your son,” and to the beloved disciple, “Here is your mother” (19:26-27). The writer of the Gospel adds, “And from that hour the disciple took her into his own home” (19:27). I expect Mary could have said similar words as she stood near the cross of Jesus. Yet Mary might have understood that the death of her son was part of God’s mysterious plan. The Gospels don’t tell us too much about her experience or faith at this time. She surely knew from the very beginning that Jesus was extraordinary and that God had something very special in store for him. There were moments when she understood that Jesus’s destiny would not be an easy one, for him or for her. For example, in Luke 2, when Simeon praised God upon seeing the baby Jesus, he delivered a chilling prophecy to Mary, “This child is destined for the falling and rising of many in Israel . . . and a sword will pierce your own soul too” (2:34-35). As we reflect upon the meaning of Christ’s death this week, Mary’s presence at the cross reminds us of the deeply human drama that is occurring, even as this drama points beyond to the majesty and mystery of God’s plan for salvation. As you reflect on the presence of Mary at the cross, what stirs within you? What thoughts? What feelings? 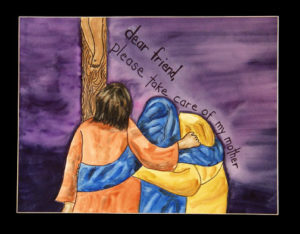 How do you think the “beloved disciple” felt as Jesus entrusted care of his mother to him? What has Jesus entrusted to you that is precious to him? Gracious Lord Jesus, when I think of your mother at the cross, I remember that you weren’t just the Son of God bearing the sins of the world. You were also the son of Mary, the boy whom she loved. Mary gives us a touching reminder of your humanity, Lord. Because you were truly human, because you truly suffered, you did indeed bear the sins of the world, and mine as well. All praise be to you, Lord Jesus! Amen.